We’re continuing our story of haying in the 1940s and 1950s on the Scheckel farm outside Seneca in the middle of Crawford County, Wisconsin. Once in a while, a chicken would be a fatality to hay mowing. It happened when cutting hay close to the farm buildings. We had, for the most part, what would be called “free range hickens”. No enclosure or chicken pens. Chickens could go as far as they wanted. Of course, most chickens stayed fairly close to the chicken house. Even chickens know where their next meal can be found. Some chickens would be in the tall hay and along comes the deadly sickle. The driver can’t see those chickens out there in the deep foliage five or six feet away. Sure enough, the chicken’s leg or two are cut off. A city slicker might think that a chicken losing its legs is a bad thing. Well, it is for the chicken, but not to the farmer, his wife, and nine children. No, that chicken meant a good Sunday dinner! Out comes the ax, onto a chopping block goes the doomed bird, one swift chop, and off goes the head of the chicken. Into a boiling pot of water, scalding the feathers, and the feathers are quickly removed. Mom butchers that chicken. But the next time we saw that chicken it was on the plate at Sunday noon. 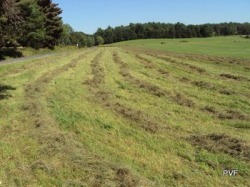 Three or four days after cutting, hay should be ready fo r the barn. The Scheckel family put up “loose hay”. Oh, the neighbors had a baler, but not on the Scheckel farm. Dad had a McCormick Deering “side rake” to put the hay in windows. In 1940, Sears Roebuck was offering side delivery rakes for less than $100, with $8.00 down. Our rake was pulled by two horses. Raking started after the dew was burned off by the summer sun. That might be about 10 o’clock in the morning. Dolly and Prince were hitched to the rake. Raking was done by about noontime. Our McC-D rake had 2 large 3-4 foot steel wheels in front, 4 bars of tines that spun on a reel that was at an angle to direction of travel. The tumbling tines would gently kick and roll the hay into straight narrow rows, ready for hay wagon and hay loader. A smaller caster wheel turned in the back. The driver saw up quite high, unlike the hay mower. I like raking hay. I had a good view, breeze blowing, straw hat to keep the sun off, the wonderful smell of cured hay. Horses, whether mowing or raking, moved at about 2 to 3 miles per hour. Our hay mower cut a 5 foot swath. 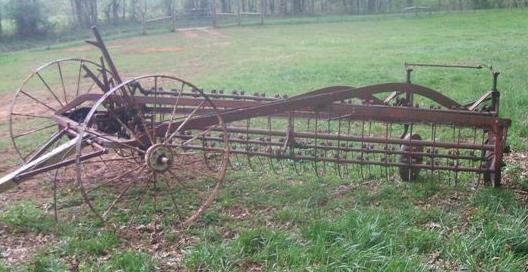 With a five-foot sickle bar, we would rake two of the five foot swaths into a single window with the side rake. If the dry was not sufficiently dry, or “too green” as was the saying, heat would build up in the hay mow. A farmer could lose his barn to fire. Seems every summer, we heard of at least one barn in Crawford County going up in flames. The Scheckels put up hay that was “green” a few times. You could go up in the haymow a few hours or a day later, press your hand down in the hay and feel the heat. If that happened, Dad or Mom would take a buckle of salt and sprinkle it on the hay. The salt would absorb the moisture and prevent heat buildup. We would occasionally run across moldy hay in the winter time when throwing hay down the chutes. The grayish color and musty smell is a dead give-away that months earlier, too much heat had built up in that area. Thanks for the comment and question. How to fill the center silo in a round barn? The farmer would back the silo filler into the cattle doors on the first floor of the barn. The filler pipe ran up the outside of the silo and the silo was located in the middle of the barn. Having a wood stave silo in the middle of the barn kept the silage from freezing. The farmer could feed the silage from the middle of the barn. Silage never had to be carried very far.